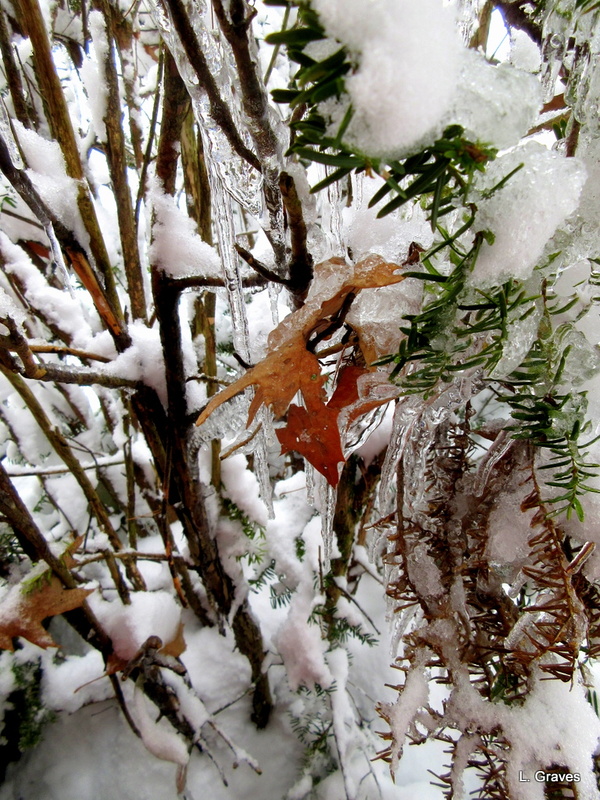 Ice, snow, and trapped leaves. Winter is still here. While I’m looking forward to spring, I’m dreading what comes next—mud and grit. At least the snow and ice are clean and beautiful. The mud and grit month must have been hard when you had young kids and pets.. Same here, but it’s retreated more than in your neck of the woods. Forecast says 60 degrees by the end of next week! I feel the same way! Though the mud and grit are a result of winter thawing out, it is a bleak time here in Maine. The planks go down for walking along the paths, the dogs bring in an ongoing trail of muddy prints, sinkholes appear in the lawn. Yuck. Spring is spongy! I never knew how glorious spring could be until I went to college in Indiana. Oh, my! No blackflies, no mud, no grit. Flowering trees. Three months of absolute bliss. yes, just returned from a short visit to Kentucky. Magnolias were blooming and there was green grass. Then, the trip was shortened in order to get home before the storm. Green grass, daffodils in bloom,people wearing shorts and short sleeves…and now, 15 inches of snow with squishy ground underneath! i’ll stay in the greenhouse until spring really makes her way!! I always love the way you capture the richness of colors in your photos. Thanks, Beth. I do a bit of editing in Picasa. I bought a new mop yesterday in preparation for mud season 😉 Dog prints mostly! I know a thing or two about dog prints. Your photo is abstract art to perfection!